Lighten up, everyone! It's a movie, right? I enjoyed the story, the acting and the effects. Step back from your angst and enjoy! 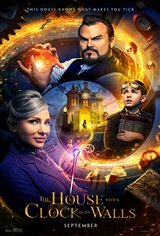 I liked the fact that the movie had Jack Black and Cate Blanchette in it. I never go by what the critics say good or bad I go see the movie if i'm interested and if not either wait till its on tv or rental if i want to see it. The acting was great, but the plot line was a bit strange to me. Also, many parts in the movie made me a bit uncomfortable. Remember, this is just me personally, but I didn’t like the movie that much. Though again, great acting and actors. What the H is going on with these reviews?!!? Satanic? Really?! If this is Satanic than so is Little Red Riding Hood, 3 Blind Mice, The Grinch and heck, why not through in the story of Christ too!! People have lost their Gosh darn minds!! A fun, magical movie for kids. Full Stop. Terrible. Walked out after 30 minutes.